To mark Mental Health Awareness Week (11 – 17 May 2015), Cause UK arranged for the Sewing Soldier, Lt. Col. Neil Stace to give an inspirational talk and sewing demonstration to the 25 residents of Mike Jackson House on Tuesday 12th May, which is a Riverside supported housing scheme, for veterans who are at risk of homelessness or who have been homeless. Cause UK has been raising the profile of Riverside since 2012. Riverside is one of the largest housing association groups in the country, owning and managing over 53,000 properties for 85,000 customers across England and Scotland. In addition to providing over 34,000 units of general needs accommodation, providing low cost home ownership, and developing and building homes Riverside delivers supported housing through a sheltered and supported arm of the business which provides services to more than 11,500 clients with a diverse range of housing needs. The homeless centre is helping to transform lives by providing health and well-being support, and employment and training opportunities to ex-service personnel, helping them make a successful transition to Civvy Street. 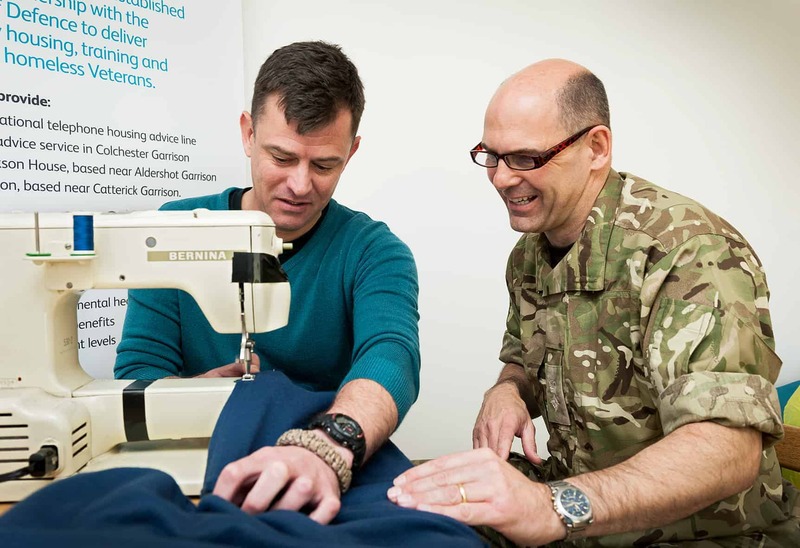 Lt. Col. Neil Stace came to prominence on the BBC’s Great British Sewing Bee, a finalist in the competition and amassing a legion of fans. A soldier for 28 years he said he hopes he can help ‘put an end’ to the stigma attached to ‘mental health illness.’ He has completed multiple tours everywhere from Afghanistan to Bosnia and Northern Ireland, and everywhere he went, his battered 1960s sewing machine went too. Neil will be giving an inspirational talk to veterans about his Tours as well as a sewing demonstration, “I have stories from teaching Afghan women to sew to making wedding dresses in Bosnia and Ladies underwear in Northern Ireland! 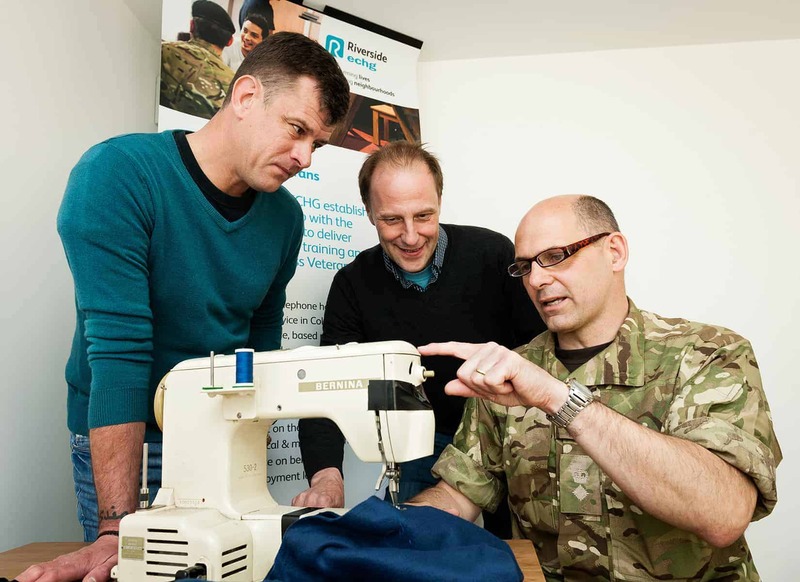 I want to show the men and women at Mike Jackson House that having a hobby like sewing and craft making can be good for your well-being and mental health and useful too, I have mended many uniforms out in the field.” The focus of Mental Health Awareness Week 2015 is ‘Mindfulness’, an integrative, mind-body based training that helps people to change the way they think and feel about their experiences as a treatment for mental health problems. According to the NHS, mental health conditions cost approximately £105 billion a year, due to loss of earnings and associated treatment and welfare costs. The cost to an individual with a mental health illness can also be high when left untreated. Each year, Riverside works with around 11,500 clients in its supported housing services. Almost 20% of clients have mental health issues, including those listed as a secondary problem combined with drugs and alcohol. More than 10% of our clients have specific mental health problems as their primary issue. Riverside offers specialist mental health support and works in partnership with local mental health agencies to help its clients. Source:  Mind  Mental Health Organisation  NHS mental health services.